The ground floor would be all glass so people walking onto the property can enjoy the views. Robert Sonnenblick is the man who wants to build a $150 million resort at Chambers Bay, and he says as soon as he saw the location it was love at first sight. “That site at Chambers Bay, on a scale of one to 10, is a 12,” said the Los Angeles-based developer. 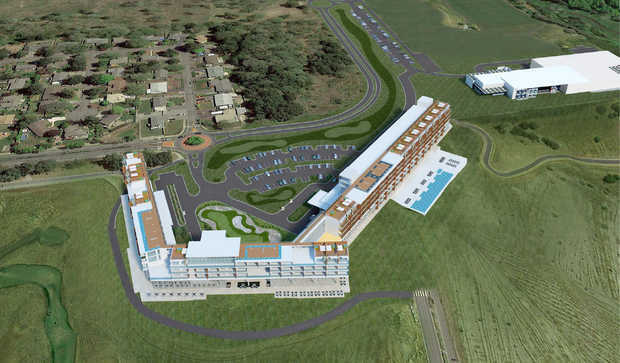 He plans to build a 258-room hotel, conference center and second golf course at the site in University Place where the U.S. Open will be played next June. Sonnenblick is chairman of Sonnenblick Development, which was formed in 2011 to specialize in four-star oceanfront resort hotels across the country, with a focus on high-end golf resorts. Sonnenblick heard about Chambers Bay about a year and half ago while working on a golf course and hotel development near Pinehurst Resort in North Carolina. Someone with the United States Golf Association told him Chambers Bay is hosting the 2015 U.S. Open and there weren’t any hotels near the golf course. Sonnenblick was in Seattle for a business trip and decided to visit the golf course, which is owned by Pierce County. He said he stopped dead in his tracks when he set foot on the property, awed by the sweeping views of Puget Sound and the Olympics. He called it the best site for a hotel he has ever seen. Part of Sonnenblick’s plan is to convert Pierce County’s award-winning Environmental Services Building into a 48,000-square-foot conference center and add a ballroom for weddings. The Environmental Services Building was designed by The Miller Hull Partnership. “To have that already on the property is something that we’re thrilled with,” he said. Pierce County is planning to build a new headquarters on the campus of the former Puget Sound Hospital and consolidate a third of its 3,000 employees. Officials say it’s too soon to say where employees now housed in the Environmental Services Building would go. Construction of the county’s new headquarters could begin early next year. The county has picked a team headed by Wright Runstad Associates, with NBBJ Architects, Gunsul + Iverson Architects and Howard S. Wright. The headquarters could open by mid-2016. Sonnenblick is big on views, and they are plentiful at Chambers Bay. The new hotel will be raised about 22 feet in the air and the ground floor will be all glass so people walking onto the property can enjoy the views. The hotel will have two restaurants and two bars. Sonnenblick said one of the bars will be like the “19th hole” found at most golf courses. Adding a second golf course is an important part of the plan. Sonnenblick said the existing course is fescue grass and golf carts aren’t allowed, so it’s a walk-only course — and that doesn’t work with a hotel. “The reason we need a second course is the normal tourist golfer does not walk,” he said. Golfers will likely have better scores on the second course because it will have wider fairways and a more forgiving layout. Sonnenblick also said he wants a “huge” increase in the number of walking paths and biking trails on the property to appeal to locals. Sonnenblick said the plan is to offer discounts on rooms, food and beverages to people from University Place, Lakewood and Steilacoom. His team just finished architectural renderings for the project and hopes to start construction next year. Sonnenblick said the U.S. Open will generate tremendous publicity for his project before it even opens because Chambers Bay will be on the cover of golf magazines and featured on golf shows, just like Pinehurst was earlier this year. 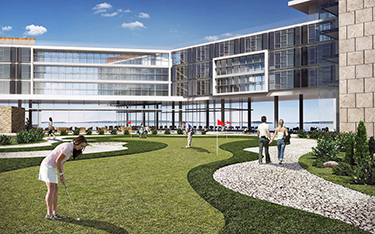 Sonnenblick said he wants to build the hotel and golf course simultaneously and hopes to open both in mid-2017. He said the entire project will be privately funded. The golf course design should be finished in about a month by architect Robert Trent Jones Jr., who also designed the original Chambers Bay Golf Course. Other team members are: the Los Angeles office of Harley Ellis Devereaux, architect; Absher Construction of Puyallup, general contractor; KPFF of Tacoma, civil engineer; PCS Structural Solutions of Tacoma, structural engineer; and Transpo Group of Kirkland, traffic consultant. Sonnenblick said he expects to hire a lot of local subcontractors. This is Sonnenblick’s first project in Washington state, but not his first business venture here. He has financed several projects here over the years, including a $165 million construction loan and $35 million equity joint venture in the mid-1980s for Herman Sarkowsky’s AT&T Gateway Tower (now Seattle Municipal Tower). Sonnenblick said several local companies have approached him about doing other projects since word got out about Chambers Bay. He said he is open to sites with views and waterfront access, but first wants to get the ball rolling on this one.